People choose (tooth-colored) composite fillings for cavities and small to medium-sized holes created in a tooth or teeth that are necessary through the process of dental work. Composite fillings have become more popular over the past several years as the cosmetic attractiveness of them is best in comparison to other solutions – as most composite fillings are toned to match tooth color. Determining whether or not composite fillings are best for you and your dental situation, it’s necessary to be seen by a licensed, professional dentist or oral surgeon. Composite tooth fillings are more popular in comparison to many of the other options and materials used to fill cavities thanks to its affordability. Plenty of people in today’s world find themselves paying out of pocket, or being responsible for hefty “co-pays” per their medical insurance providers. Whether or not you and your dental situation call for a composite filling relies heavily on the current condition of your teeth or tooth, as well as the proposed necessary medical procedure for restoring and preventing further damage. Typically, composite-fillings are most popular among younger individuals, however this is not always necessarily the case. While a composite-filling can be technically used for larger oral incidences, and root-canals, it’s not recommended. In terms of structure, strength, and durability these do not typically seem appropriate as a solution – at least for the long-term. This lastly leads us to the reality that composite fillings while affordable and usually being a quite-simple “one visit” procedure, they do not outlast most of its competing materials for fillings. Veneers, as well as other synthetic plastics or even metal-fillings are most popular not only for larger procedures, but also their long-lasting, durability and quality of materials. However, as mentioned previously, society seems much less inclined to rely on these metal materials and synthetic plastics, as they are typically “not appealing” to the eyes for most people – nor do they match the tone of their teeth. While this strongly depends on age, personal preference is not always an option. 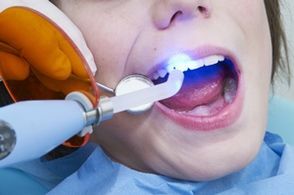 On the downside, veneers and other metals when filling cavities not only include a much lengthier process and multiple dentist-visits, but can also (undesirably) require the removal of much more tooth enamel which is not an objective approach for various reasons – the main one being longevity of your actual teeth. All in all, composite fillings are a nice, cheap, and quick-fix alternative to situations that involve the removal of tooth enamel, such as removing cavities. Ultimately, no ‘”filling” will last forever, so it comes down to funds or medical coverage available, as well as the size of procedure, level of comfort, and time dedicated to said oral procedure.